2 Ajaw 18 Ch’en. Drawing by Jorge Pérez de Lara. Our hearts go out to our friends in Chiapas, Mexico City, the United States and the Caribbean who have been dealing with the devastation and aftermath of the multiple earthquakes and hurricanes, and to all of those affected by these tragedies. Due to the earthquake in Chiapas, the Pre-Congreso event scheduled for September 23-25 has had to be postponed until November, and we wish all the best to our Maya colleagues for a rapid recovery and a successful event. This month, I have decided to highlight four of our mini-grant recipients since we have received so many reports back from the field this year, and I would like to celebrate as many of our mini-grant recipients as I can. 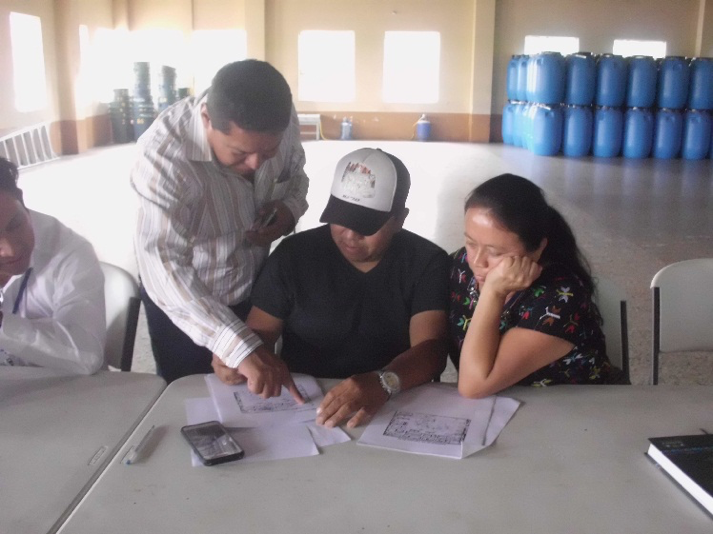 These workshops, which took place in Chiapas, Yucatan, and Guatemala, are an excellent representation of the range of projects made possible by the generous support of our donors. 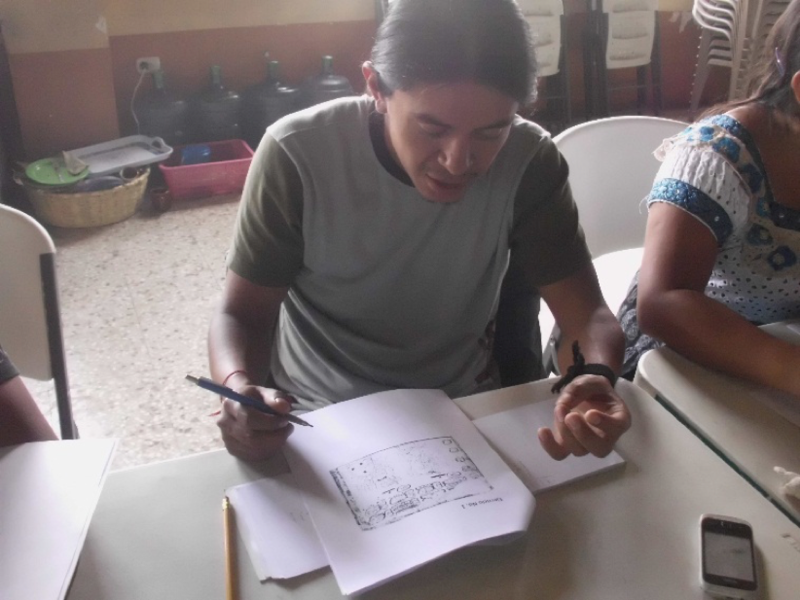 Immersed in the use of the Maya hieroglyphic script and the calendar, students in these workshops throughout the Mundo Maya produced beautiful works of art, while also learning to read, write and perform calendrical calculations in the writing system of their ancestors. 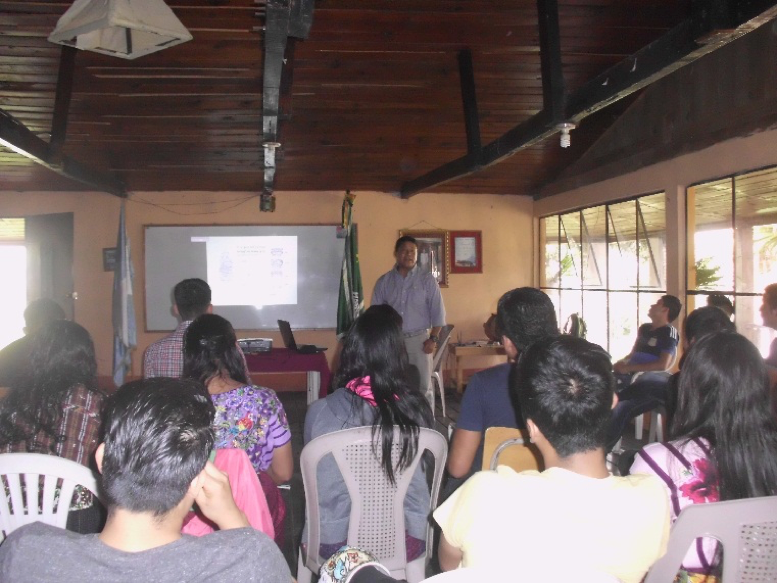 Working with a group of 25 Tzeltal students from the Universidad Intercultural de Chiapas, together with the Casa de Cultura, Martín Gómez Kontsal led a workshop on the history and origins of Maya writing in June of 2017, with the objective of having the students understand and use the Maya script for the purposes of writing in contemporary Tzeltal. 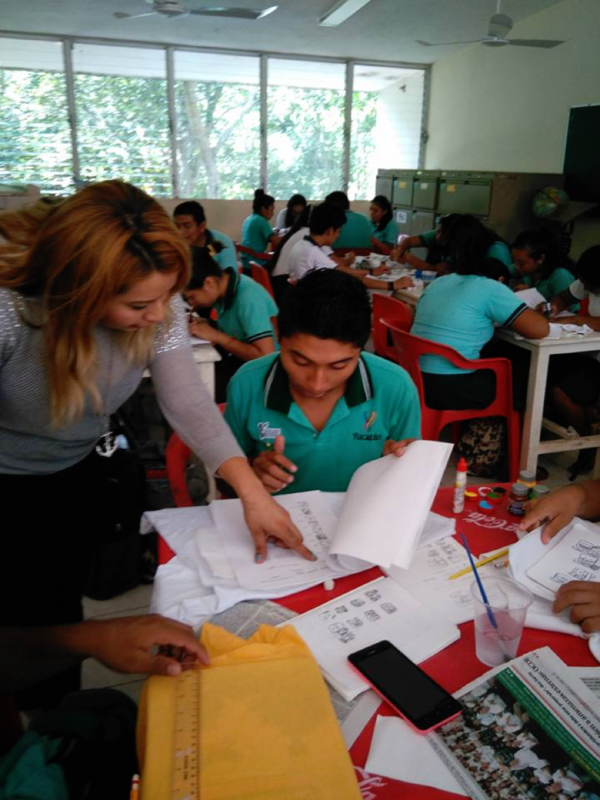 Working in teams, the students were thoroughly instructed on the use of the Maya syllabary, and they produced beautiful, large, full-color glyph blocks for each of the family lineage names that originate in Oxchujk. 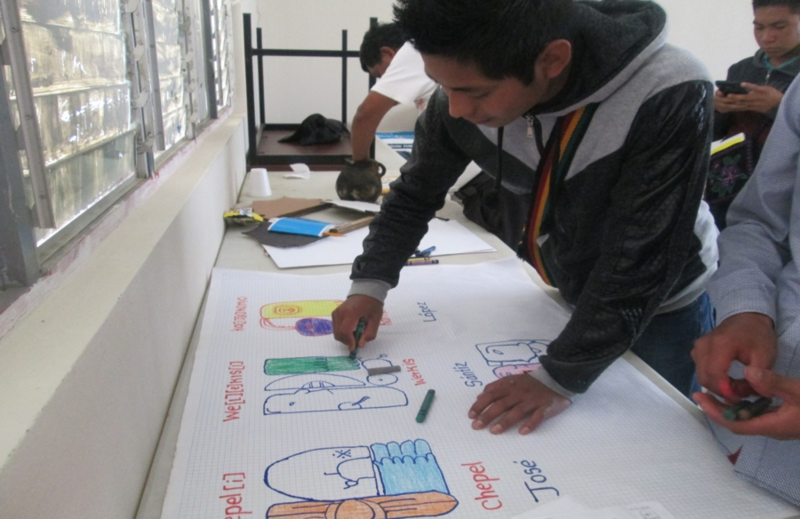 Martín plans to lead another similar workshop for primary school children in Oxchujk in the near future. To identify, treasure, and transmit the codes that make up our original culture, threatened by national culture and globalization, are some of the main tasks that writers and researchers must fulfill. 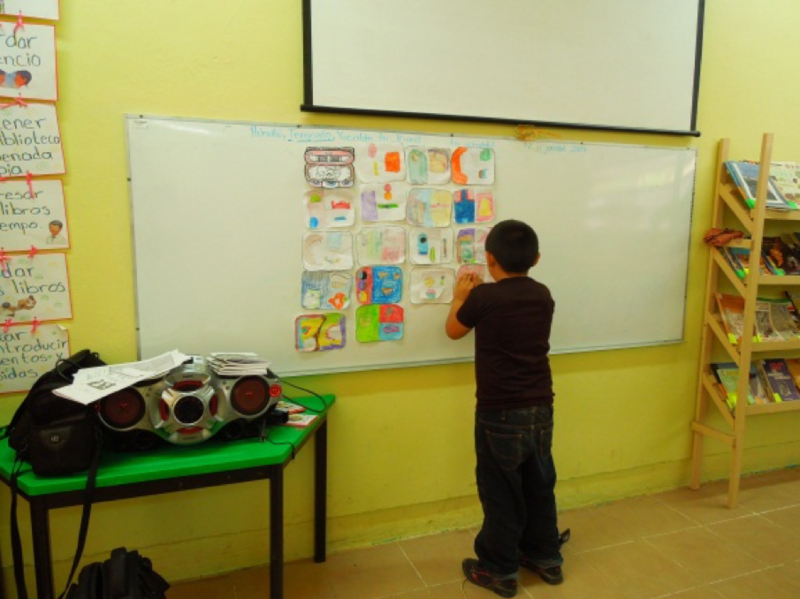 I decided to give this workshop in that school since the majority of the student population are Mayan speakers. 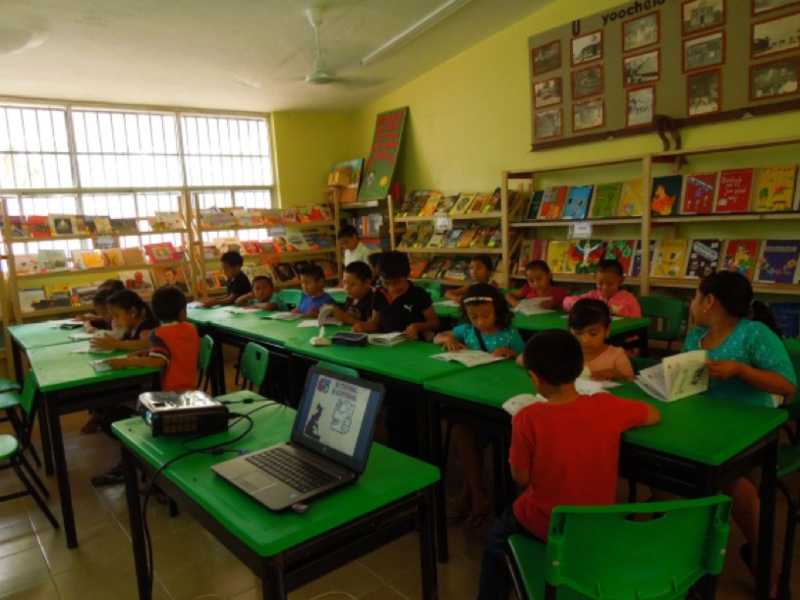 These students come from populations such as Maní, Tipikal, Teabo, Mayapan, Cantamayec and Chumayel…the students were very excited and willing to learn the writing of our Mayan elders. 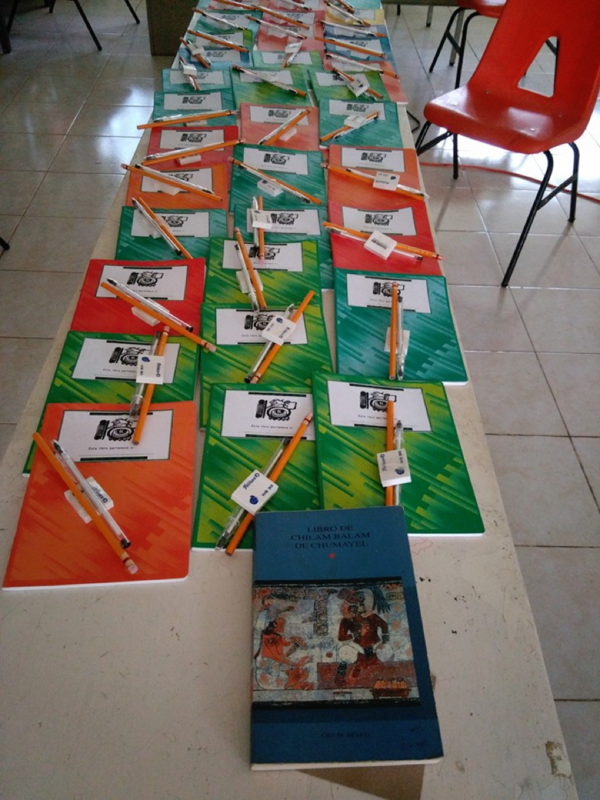 Each student was given a personalized notebook containing resources for the Maya Syllabary and logograms. 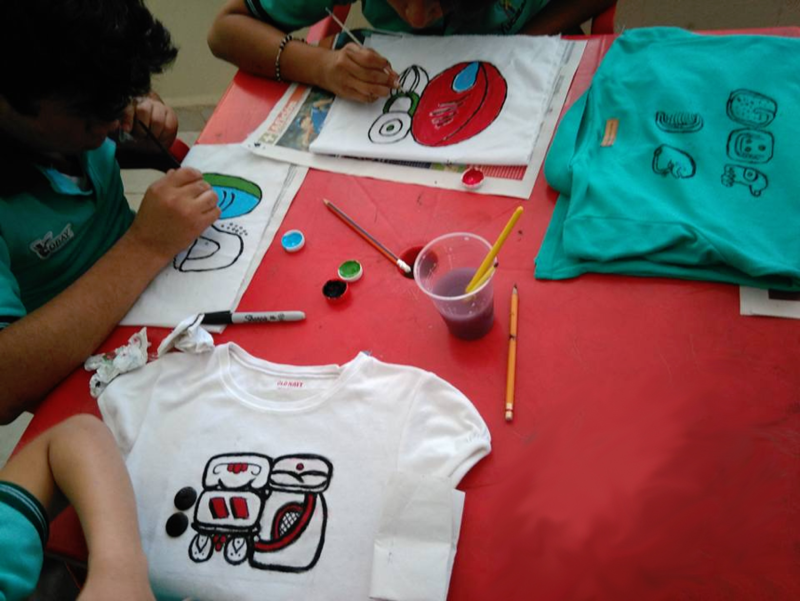 After learning to read and write using the Maya hieroglyphic script, students painted their names and the name of their villages onto T-shirts. They also made jewelry out of seeds from the region, inscribed with Mayan numbers. At the end of the three month workshop, the students were given a certificate of completion. Students were given personalized notebooks as Aj Tz’ib’ scribes. 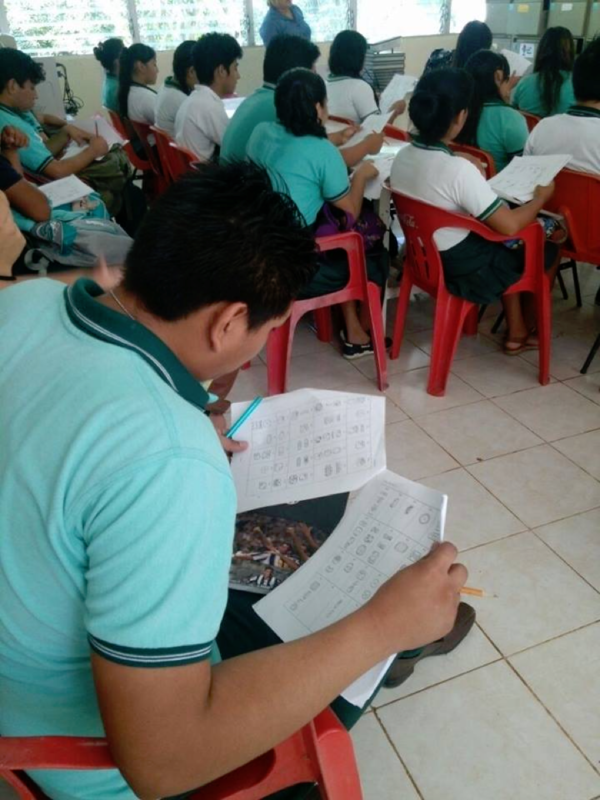 Students in Colegio de Bachilleres learn the Maya Syllabary. Daniela Cano Chan introducing the students to logograms. Students paint their names onto T-shirts. 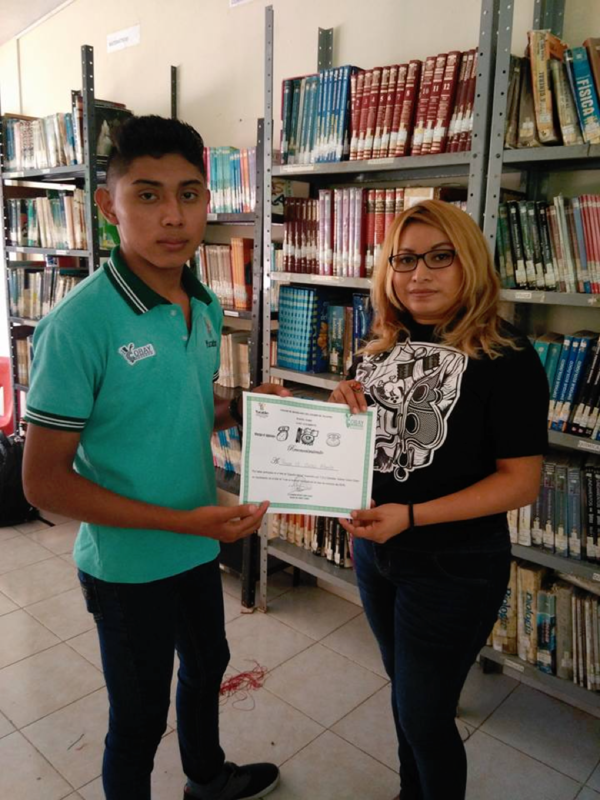 Daniela Cano Chan gave each student a certificate of completion. In a previous blog from April 20, 2013, we featured Clemente Peneleu, who has his own regular radio program concerning the use of the Maya Calendar. 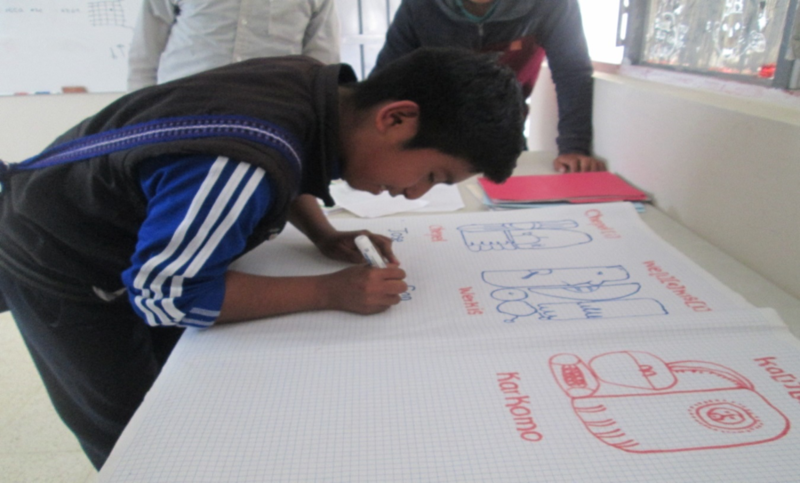 In April of this year, Clemente led two calendrical workshops for a group of 51 Tzutujil children and high school students from San Pedro La Laguna and Santiago Atitlán, Sololá, Guatemala. 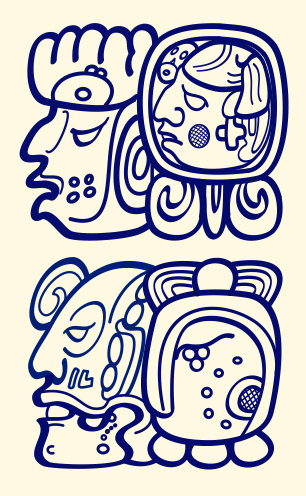 Clemente reports that the students requested follow up training activities to continue their study of Maya calendrics. 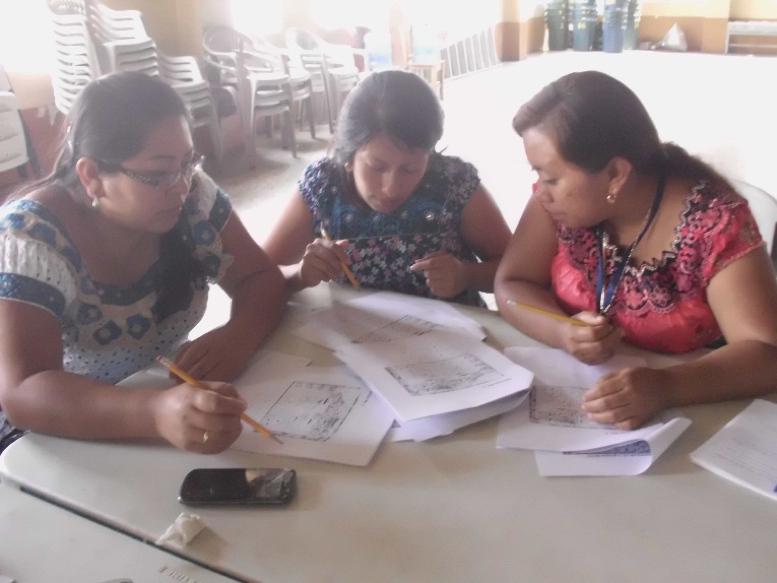 Furthermore, they committed to continuing to pursue their study of Maya calendrics and to publicize the values and life system of their ancestors. 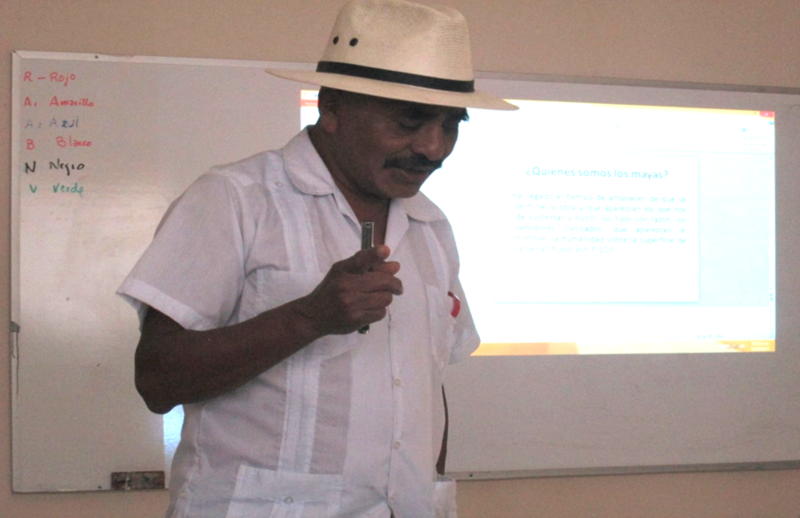 Clemente Peneleu instructs the students about the Maya Calendar. Clemente Peneleu and his students explore the Madrid Codex. Tzutujil students discuss calendrical calculations. 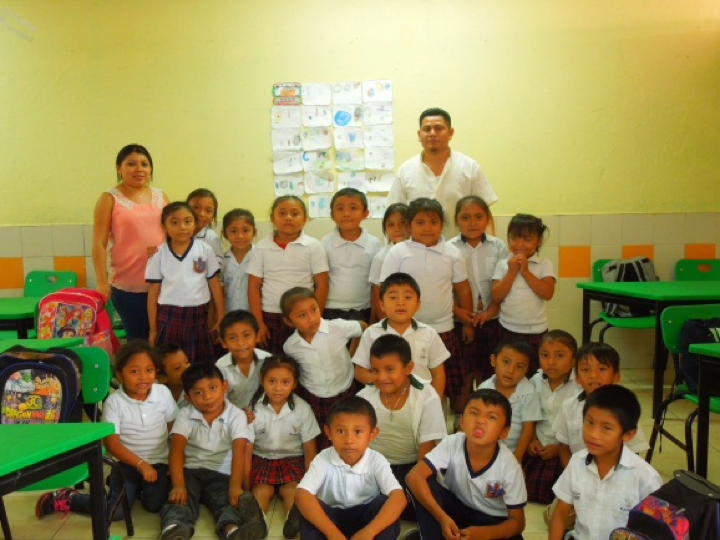 Close to the ancient site of Ek’ Balam, Erika Evangelina Puc Ay and José Alfredo Hau Caamal, with help from Gregorio Hau Caamal, led a series of workshops for elementary school students from the Benito Juaréz García School in April of 2017. The first workshop, with 18 second grade students, followed a previous workshop that these students had attended. 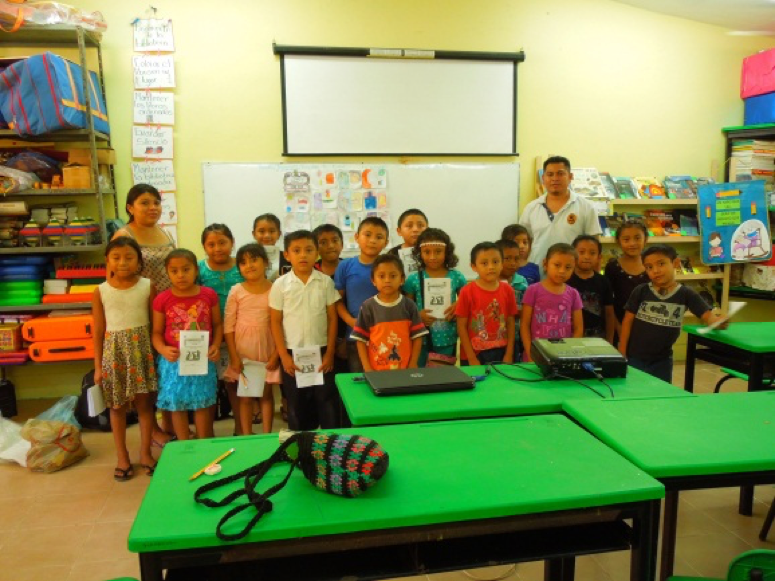 Having previous experience with the Maya Syllabary, these students demonstrated a proficiency with reading and writing in Maya glyphs. 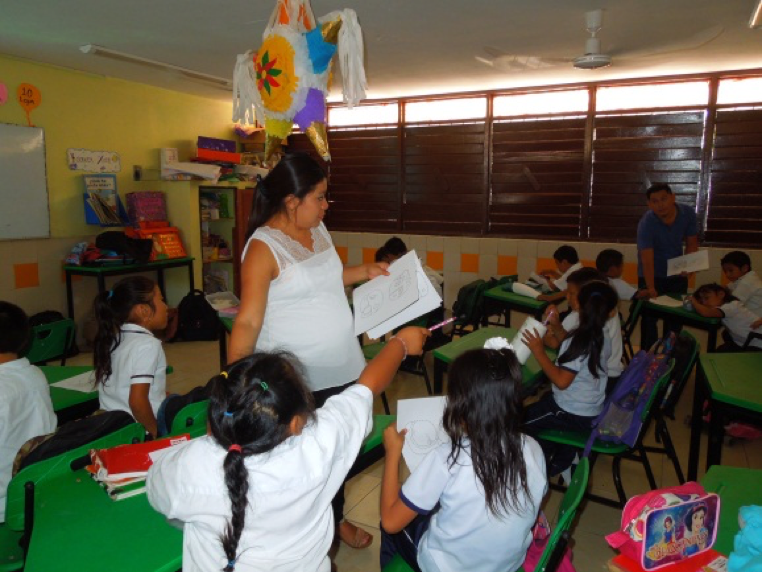 The second series of workshops introduced 24 first grade students to the reading and writing of the script. 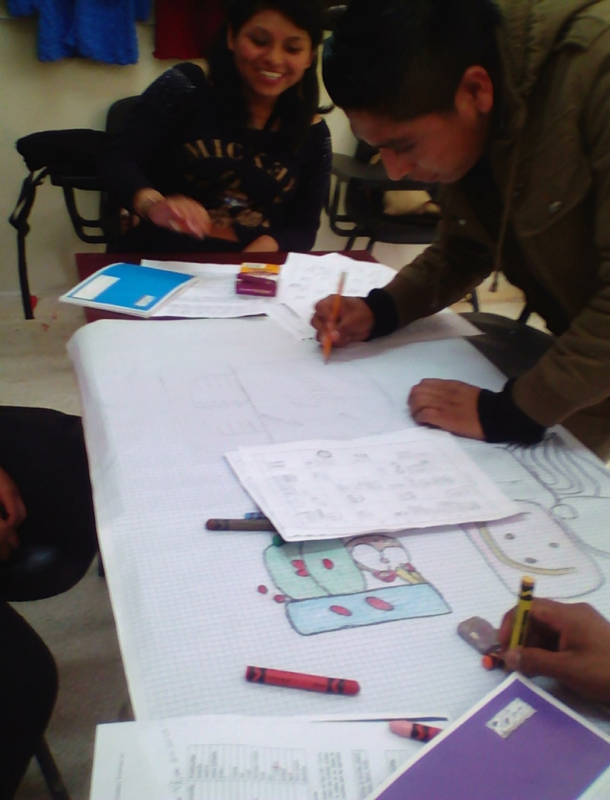 “At the end of the workshop, the children learned the use of the syllabary, recognized hieroglyphic writing and remembered their ancestors. 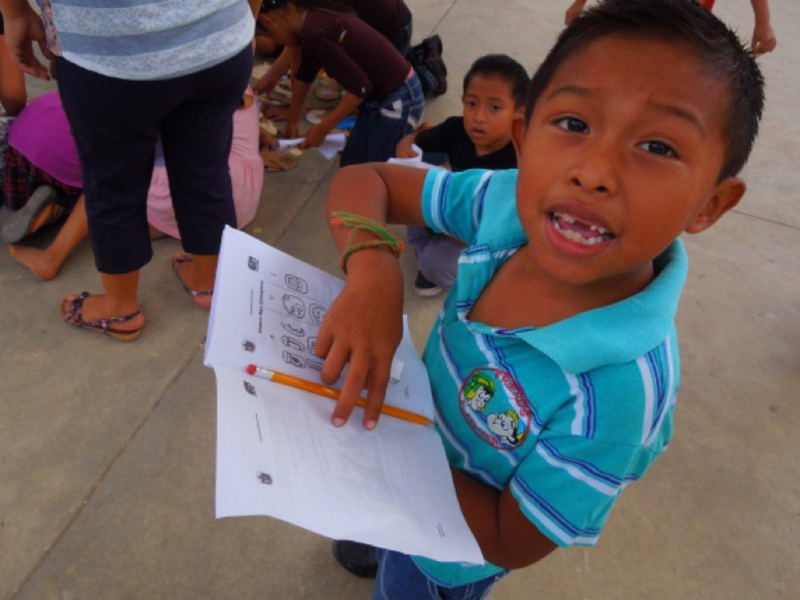 Because of the proximity to the ancient city of Ek’ Balam, the students recognized what was written there and the possession of an unequaled wealth. Many of the children with relatives working in that place expressed their intention to learn to read the stelae. Students from second grade search for syllables in their booklets. Stela created with their surnames. First grade students color the syllables. Es alegre ver cada vez más estudiantes de epigrafía maya. Quiera el Ajaw que se puede recobrar de nuevo la escritura en todo el pueblo Maya.